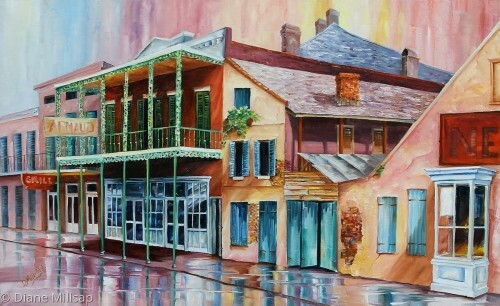 SOLD - The quaint and sometimes curious buildings of the French Quarter continue on through the centuries. (Inspired by an archival B&W photo) Painted on a gallery wrapped canvas, ready to hang. 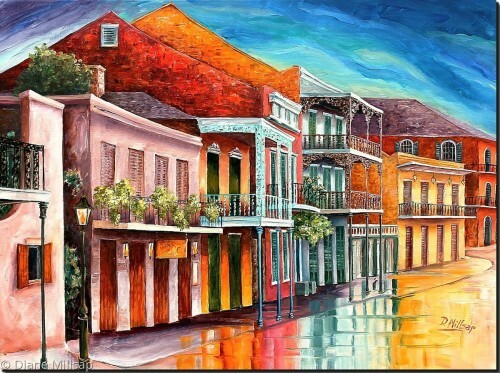 FOR SALE - Those beautiful, quiet moments in New Orleans' French Quarter are captured in this large original. The air is still, reflections glisten on the damp streets, and tropical plants bedeck the balconies. Painted on a gallery wrapped canvas, this painting is ready to hang. Please contact me for purchasing information. 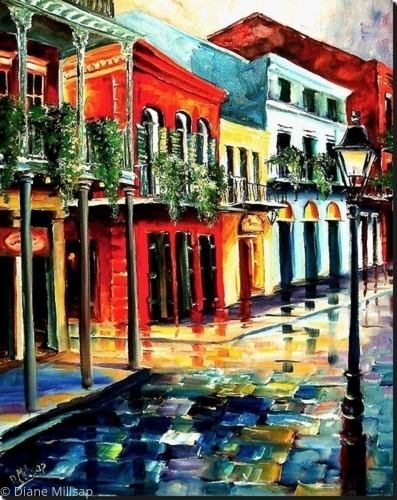 SOLD: This moody painting captures the mysterious atmosphere of the old French Quarter in New Orleans. Painted on a gallery wrapped canvas. 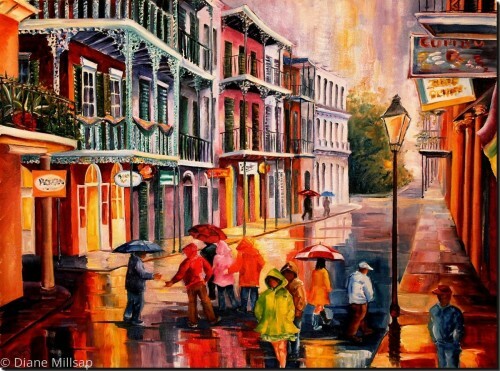 FOR SALE: This large original oil painting captures the color and liveliness of the French Quarter, even in the rain! It's painted on a deep, gallery wrapped canvas, and is ready to hang. 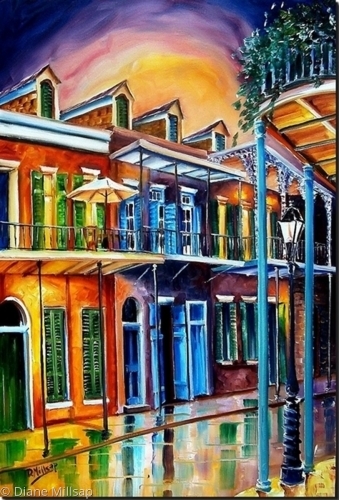 FOR SALE- The gas lights are lit in the old French Quarter; and looking down the street, one can catch a glimpse of the St. Louis Cathedral. This orginal oil is painted on a deep gallery wrapped canvs and is ready to hang. 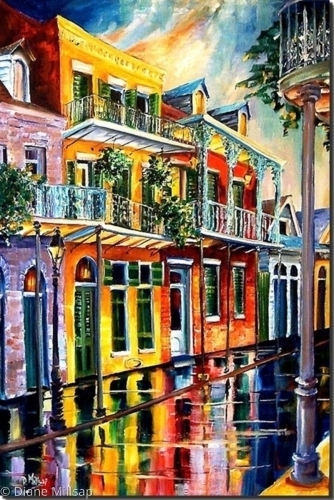 SOLD: This large original oil captures a rainy day in the French Quarter, where the architecture is still beautiful and the reflections are amazing! Painted on gallery wrapped canvas, ready to hang. Please contact me for more information. 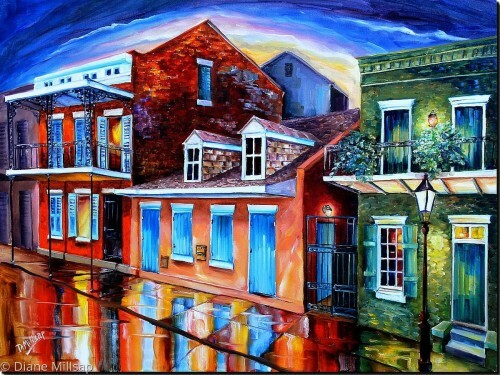 A dark day in the French Quarter still has lights and color. Painted stucco walls and iron balconies of the most subtle pastel hues make this place a city of enchantment! Oil on gallery wrapped canvas. 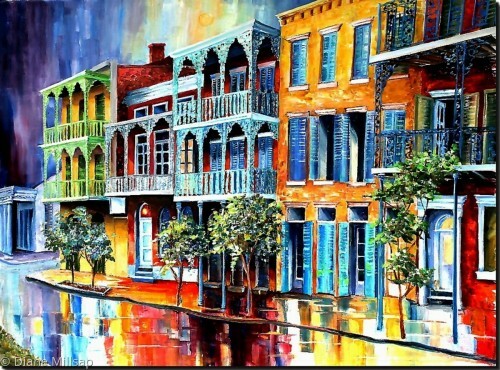 The painted Creole town houses, heavy shutters, and iron balconies make the French Quarter a beauty to behold. This original oil focuses on ths architecture of this historic city. When in the French Quarter, you may stumble across "Exchange Alley," where you can take a quiet moment to catch your breath and admire the beautiful architecture. 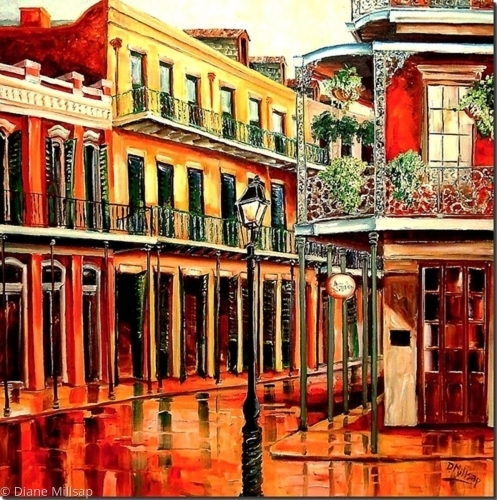 Painted in Diane's modern Impressionist style, this oil painting brings New Orleans to life with the traditional colors of the French Quarter. It may be hung unframed. The edges of the 1" deep gallery wrapped canvas are painted black. 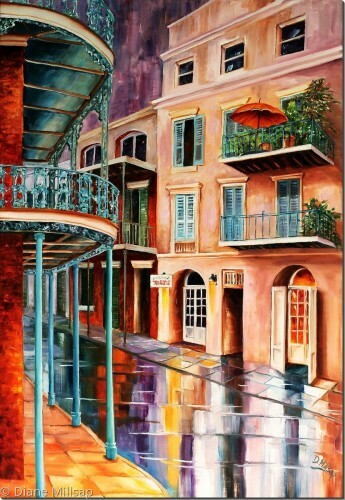 "Rain on Royal Street" $899.00-The soft colors of painted iron balconies and the warm pastels of centuries old buildings are reflected in the wet streets of Rue Royal. 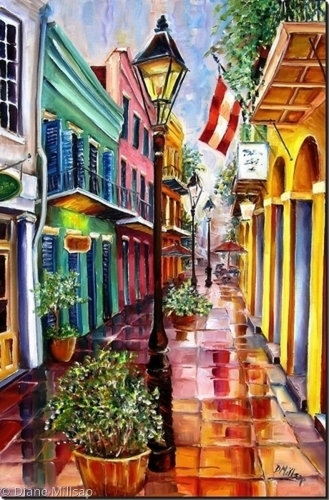 This large original oil, which measures 6 ft. high x 4 ft. wide, gives the illusion of walking right into a street in the French Quarter. It is painted in an abstract-impressionist style on a 2" deep gallery wrapped canvas. 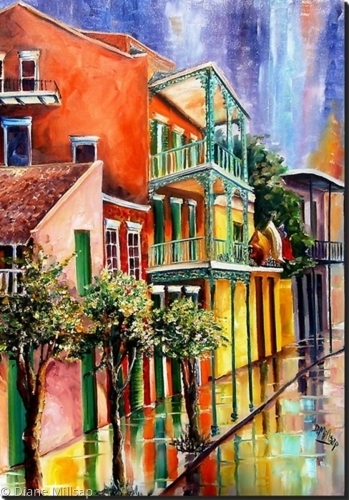 $495.00 - The colorful stucco buildings on St. Peter's Street create dazzling reflections on this old French Quarter street. 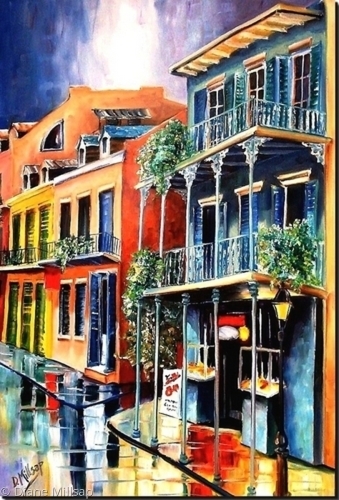 Painted in Diane's modern impressionist style, this original oil painting is vibrant and alive with the spirit of New Orleans. It may be hung unframed. The edges of the 1 1/2" deep gallery wrapped canvas are also painted, and a picture wire kit is included. 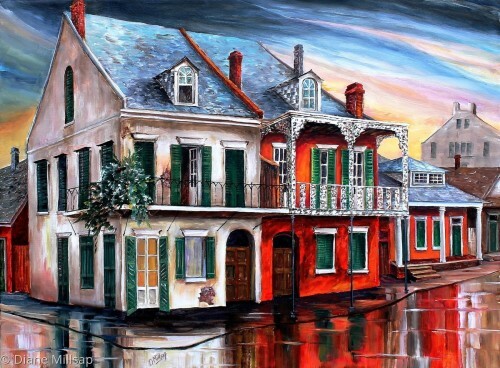 Standing firmly for centuries, the old Creole cottages on Toulouse Street cast their reflections on a rainy day. 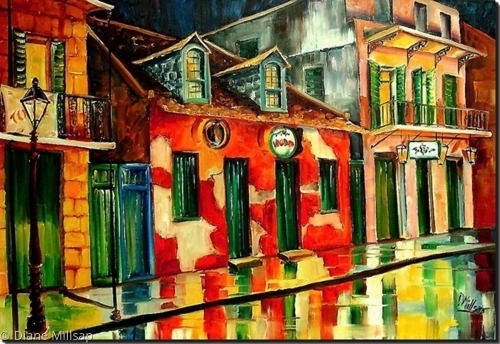 This large French Quarter scene is painted in Diane's modern impressionist style with broad brush strokes and bold color. It may be hung unframed. The edges of the 1 1/2" deep gallery wrapped canvas are also painted, and a picture wire kit is included. This is a one-of-a-kind original oil painting, and a certificate of authenticity will be enclosed. 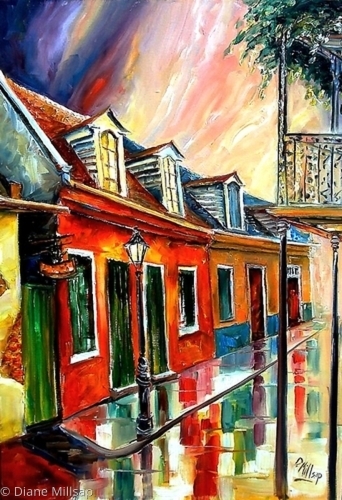 Diane's New Orleans scenes are in print, and this is an opportunity to own an original. 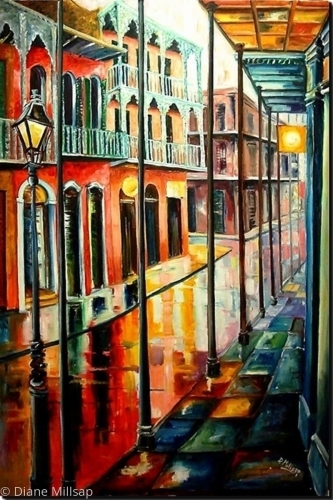 This large original oil painting captures the shimmering reflections on a rainy day in the old French Quarter. It is painted in Diane's modern impressionist style with wide, expressive brush strokes. No frame is required. Edges of the deep canvas are also painted. 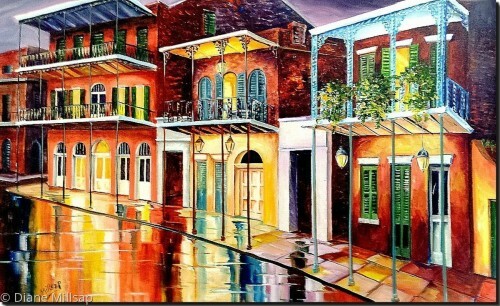 This huge original oil painting captures the reflected beauty of a rainy day in New Orleans. It is painted on a 1 1/2" deep gallery wrapped square canvas in Diane's modern impressionist style. The edges of the canvas are also painted. 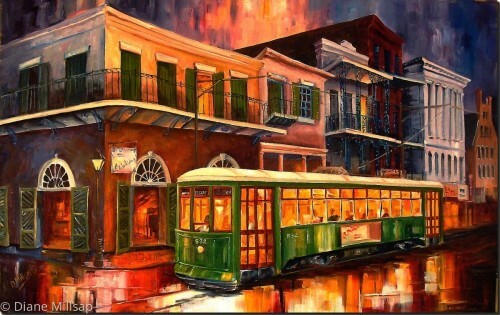 SOLD: Back in the day, the streetcar named "Desire" ran through the old French Quarter. Thanks to the writer Tennessee Williams, it will be long remembered. 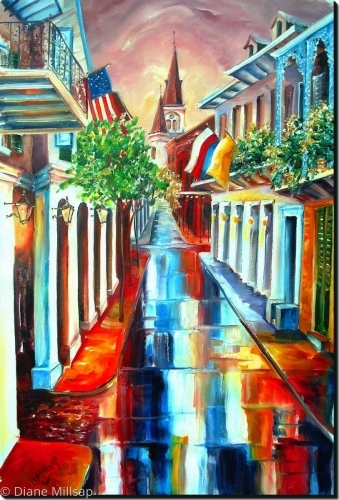 SOLD: Glowing at night, the old streets of the French Quarter cast a spell of mystery and enchantment. 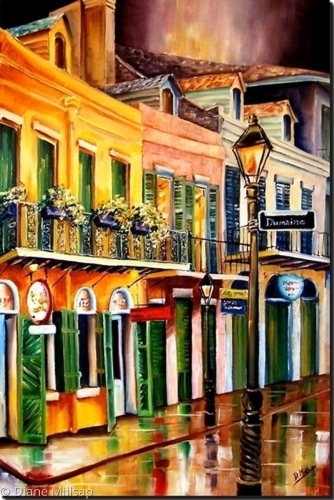 This original is painted on a gallery wrapped canvas and is ready to hang. Contact me for purchasing information. 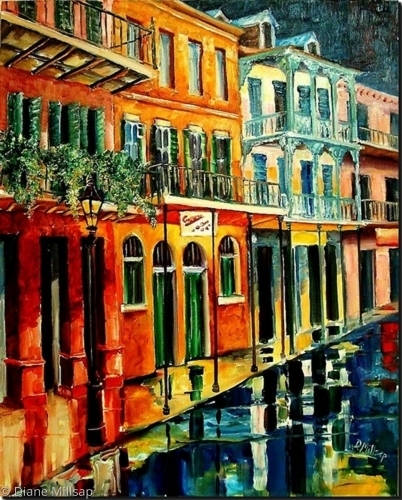 SOLD: The sky is darkening,and the reflections on Burgundy Street shimmer, creating an atmosphere of quiet mystery. Painted on a gallery wrapped canvas, this original oil is ready to hang.